Precision sensor manufacturer Micro-Epsilon has launched a new laser triangulation sensor with integrated controller that offers even higher performance and is fast and easy to set up. The sensor is suitable for high speed, distance, displacement and position measurements in a wide range of applications, including automation, machine building, electronics production, packaging, automotive and process manufacturing. 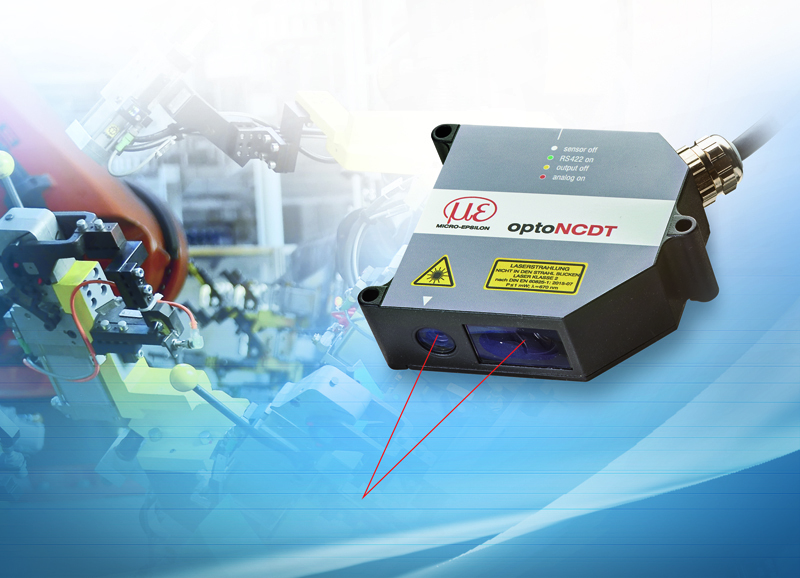 The new compact optoNCDT 1750 laser triangulation sensor succeeds the optoNCDT 1700 series of laser sensors. The optoNCDT 1750 is a powerful sensor that provides a variety of new features combined with higher measuring rates, robustness and reliability. Based on an innovative web interface, the optoNCDT 1750 is incredibly easy to use and set up without requiring any additional operating software. The settings for the measurement task can be quickly selected using application-specific, predefined presets. These are available to suit a wide variety of materials and surface types, including metals, plastics and organics. These presets enable rapid, straightforward set up and help to optimise the sensor for specific tasks. The measuring rate is continuously adjustable up to 7.5kHz and can be individually adapted to suit each measurement task. Peak selection and suppression of interference peaks enable reliable measurements on coated materials, measurement objects located behind glass and on film-sealed components. Data output is via analogue or digital RS422 interface. Furthermore, the optoNCDT 1750 provides two switching outputs that are controllable. Due to the Advanced Real Time Surface Compensation (A-RTSC) feature, the sensor operates almost regardless of the target material and colour. The exposure time or amount of light produced by the laser sensor is optimally matched to the reflection characteristics of the target surface, which enables reliable measurements even of difficult, changing surfaces. New evaluation software algorithms and enhanced components provide even higher measurement accuracy and dynamics. High performance optics generate a small spot size onto the target, which enables very small objects to be measured accurately and reliably. The optoNCDT 1750 series is available in measuring ranges from 2mm up to 200mm. Maximum linearity is 1.6µm.